The aim of the Apostles of the Sacred Heart of Jesus is to attain a perfect love for God by making the Heart of Jesus known and loved, by living the law of charity among all people, and by embracing the evangelical counsels of chastity, poverty, and obedience. We voluntarily follow Jesus in order to imitate His virtues according to the Gospel and to understand, in the genuine spirit of the congregation, the loving secrets of his heart. The motto of the Apostles of the Sacred Heart of Jesus is "Caritas Christi Urget Nos—The Love of Christ Impels Us," summarizing the moving force in our lives. 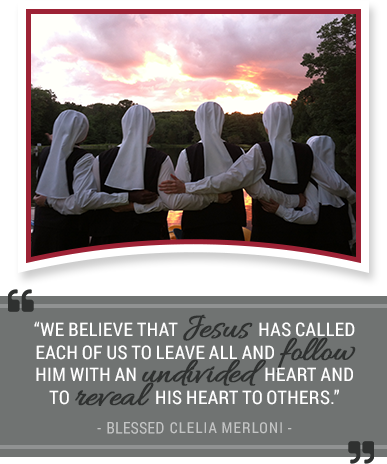 We believe that Jesus has called each of us to leave all to follow Him with an undivided heart and to reveal His heart to others. The Apostles of the Sacred Heart of Jesus place ourselves in the service of the church and the people of God. By virtue of our consecration, we are sent in mission. The power and creativity of our missionary zeal flows from our living out our charism of profound love for God and for others as envisioned by Blessed Clelia.